In fact, if anything, my sub-optimal character builds were me being lazy, and not doing the homework other players were doing to build more optimized characters. At the same time, as GM you should min-max the opposition to the same level as you have allowed for your players. Dig into the system and look for how to optimize NPC’s and monsters. That is likely going to be more work for you, as you may need to take stock stat blocks and beef them up, but it will create challenging opponents for the players, making encounters more exciting. This concisely captures why I gravitate away from games that support or require significant optimization. It’s just making more work for everyone involved, and not in a way that adds to the play experience. It’s work inflation: everyone needs to spend more time in order to get the same result. And the result is the same, assuming that competition has no value (which it does not, for me, in RPGs). Compare this to working more on setting detail or even character personality. Such preparation can consume as much time as you want, but it can also qualitatively improve the play experience. Optimization and what I am going to call (for lack of a better term) preparation can thus be seen as two independent dimensions of out-of-game work required by RPGs, leading to four rough categories of game: high-op/high-prep, high-op/low-prep, and so forth. A railroad is a way of constraining preparation requirements. There may be some overall conservation law operating such that sustainable games on average tend to be low in either or both dimensions. This may be why it is difficult for me to find an example of a game that is naturally high in both categories. 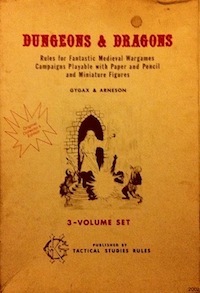 Games associated with high optimization (Pathfinder, 4E D&D) can be played using sandboxes or with more extensive world building, but doing so ends up being a higher-maintenance activity. As an observation it seems that many games in the focused design tradition, especially Forge and Story Games, seem to prize minimization of both kinds of work. Games like Lady Blackbird and Apocalypse World, for example, put few barriers before getting started (AW requires the MC to create some fronts, but the instructions seem geared to avoid potential scope creep). Minimizing out-of-game work a way to increase approachability by decreasing cost. If the reliability of play experience varies with the prep time, that is seen as a flaw in this tradition. The system is seen as “not working” if play is inconsistent, as it will surely be if preparation is required given that different groups or players will invest in different amounts of out-of-game work. Other traditions seem to focus more on the other side of the equation: increasing value (such as the intricate setting and art of Warhammer, or atmosphere of the World of Darkness, separate from amount of work required). Obviously, the two approaches are not exclusive, but there still seem to be trends toward one or the other. This entry was posted in Techniques on April 19, 2015 by Necropraxis.